Yazoo County Middle School was selected as one of twenty Mississippi sites to receive a 5 Day Teaching Artist Residency through the Mississippi Alliance for Arts Education (MAAE) Arts in Academics Program through a generous gift from the Weissman Family Foundation and support from the MS Arts Commission. This Residency Program provides a Teaching artist to partner with teachers and students in classroom experiences that connect the arts with subject content for deeper understanding. Mr. Phillip Wright is collaborating with Yazoo County Middle School in the areas of math and science to offer this arts integration opportunity with students in grades 6-8. “Arts in academics bring learning to life and are vital to a comprehensive, well-rounded education for our students,” said Penny Wallin, Executive Director of MAAE and Associate Professor of Educational Leadership at MSU. “The mission of MAAE is to insure that Mississippi students have equitable access to learning by supporting discovery, knowledge, and creativity, so that our children become life-learners who are able to use the arts as a lens for understanding and appreciating their world”. 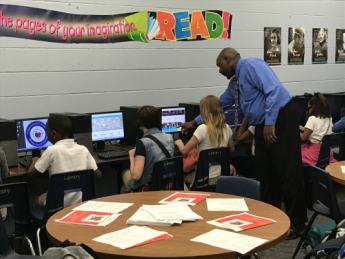 Yazoo County Middle School has incorporated a S.T.E.A.M. ACADEMY for the 2017-2018 school year which includes a rotation of classes for 6th and 7th graders in Digital Citizenship, Horticulture, Leadership Development, Problem Solving, Drama/Debate, Coding/Robotics, and Introduction to Spanish. Along with these classes, math will be incorporated into all subjects in preparation for the addition of advanced math classes. As YCMS embraces the challenge of offering rigorous and relevant curriculum needed to help students become college and career ready, the goal of the S.T.E.A.M. ACADEMY is to expose students to the many career choices in the fields of science, technology, engineering, arts, and mathematics while building background knowledge necessary for success in these career areas.